With the purchase of Mekel Technology in 2003 and Wicks and Wilson in 2011, The Crowley Company became a manufacturer as well as a distributor. 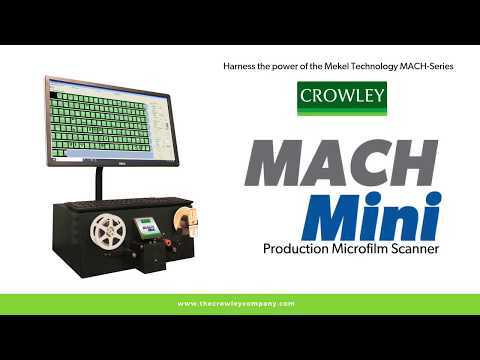 Today, The Crowley Company’s research and development divisions have greatly expanded and continue to improve our current scanner and capture brand offerings as well as innovate new technology, including the portable MACH Mini Production Microfilm Scanner and the ODS Overhead Document Scanner. As a natural extension, Crowley’s imaging offerings have diversified into microfilm image hosting with IMAGEhost, the manufacturing of the MACHCAM cultural heritage and machine vision camera and TrueImage M1000 document examination platform for the security industry. Scans A2-A3 size documents, bound books, notebooks, binders, photographs, graphic arts and more. Crowley has partnered with ID Scientific to engineer and manufacture the TrueImage M1000, a second-level document examination platform for passport, currency and personal identification investigation. Scan and host microfilm and microfiche collections in their original format and access images from any mobile or traditional device with WiFi access. In addition, The Crowley Company offers the MACH 7380HDX reference archive scanner, which offers single/multi-image and batch scanning from reference microfilm (also known as image marker or blip microfilm). The 7380HDX is ideal for daily search and retrieve operations.